No. 159. O lassie, are ye sleepin yet? Tune : Will ye lend me your loom, lass? Cal.Pocket Companion, 1752, iv. p. 21. ChorusO, let me in this ae night, This ae, ae, ae night; O, let me in this ae night, Vll no come back again, jo! 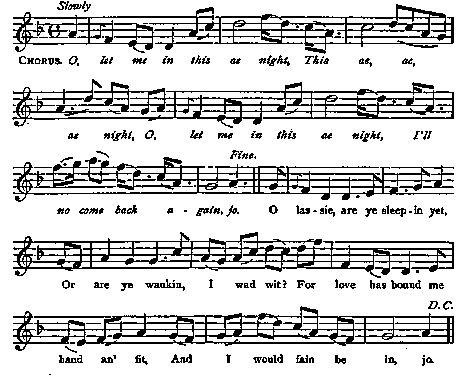 O lassie, are ye sleepin yet, Or are ye waukin, I wad wit? For love has bound me hand an' fit, And I would fain be in, jo. And shield me frae the rain, jo. The bitter blast that round me blaws, Unheeded howls, unheeded fa's : The cauldness o' thy heart's the cause Of a' my grief and pine, jo.